Last month we cleaned up all the pollen, added a new dining set and got the back porch ready for entertaining. 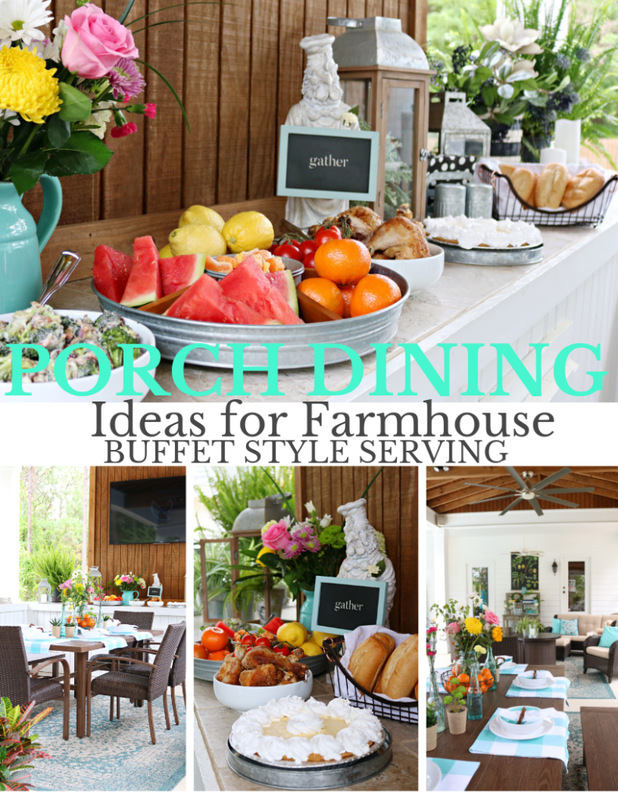 Today I’m sharing ideas for a buffet style dining experience. We have three areas under the covered porch that are perfect for enjoying life outside. Let me show you how we use each area. 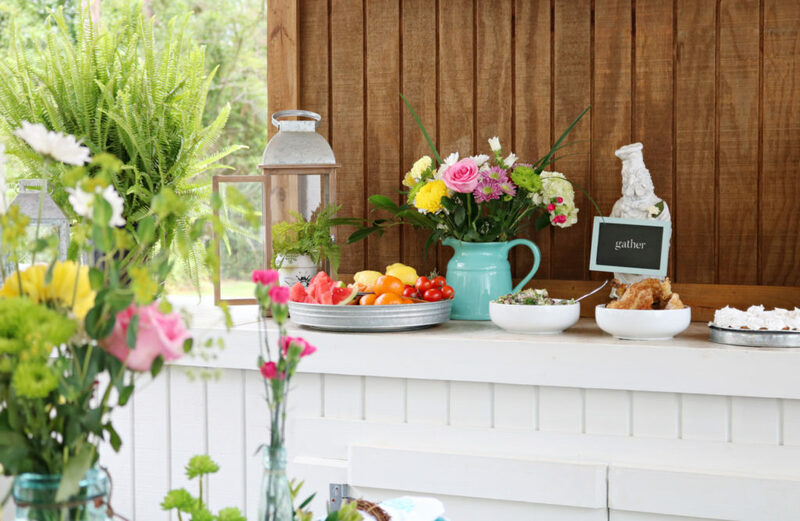 It’s much easier to serve meals outside and I think it makes the food taste better! 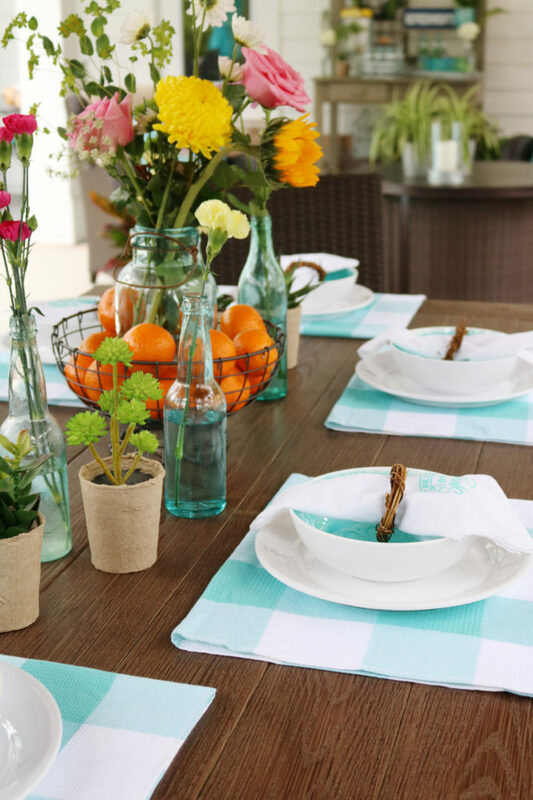 Creating a relaxing outdoor dining experience is easy. Just a few things from around the house, affordable items to set the table and serve with and that’s all you’ll need. To make it fun, I like to start with color and let nature inspire me when decorating outside. 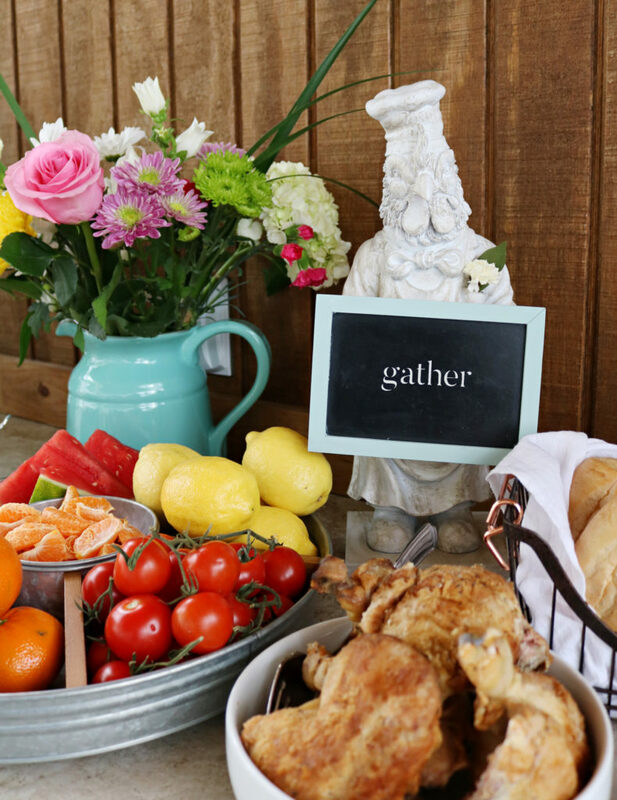 Using inexpensive flowers from Walmart and colorful fruit and veggies really make the table and buffet area come alive. 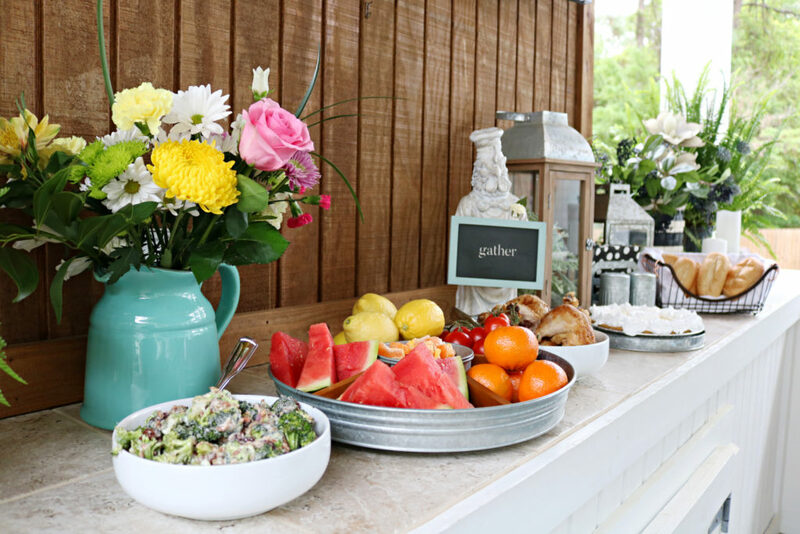 The white dinner plate will make it easy to change up from party to party, just pop any colorful bowl or salad plate on top and you have a new look. The Better Homes & Gardens wire basket is holds one of my vintage mason jars filled with grocery store flowers. I filled in around the jar with tangerines for more color and the kids love snacking on them. 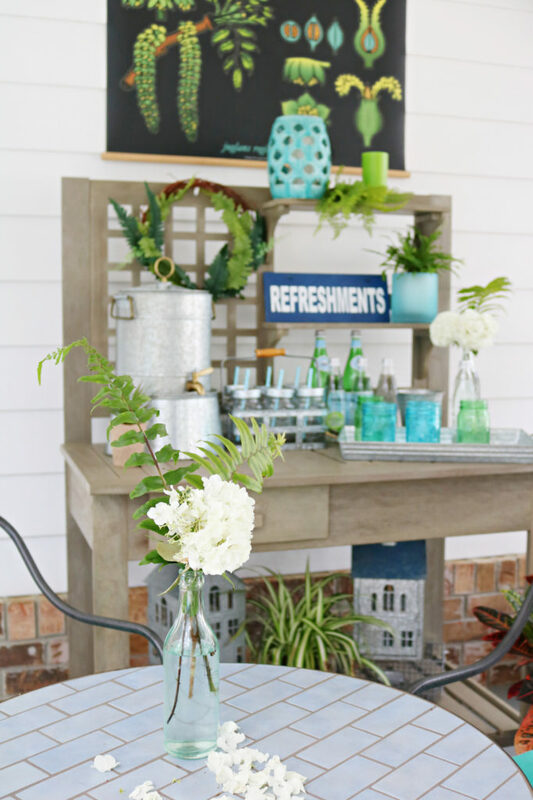 Shop your house for tablescape items, like these peat pot succulents, I use them anytime I need a pop of green. I have a small collection of old soda bottles and I love adding flowers in them to spread down the center of the table. Keeping the decor on the table at a low height makes communicating across the table a lot easier. 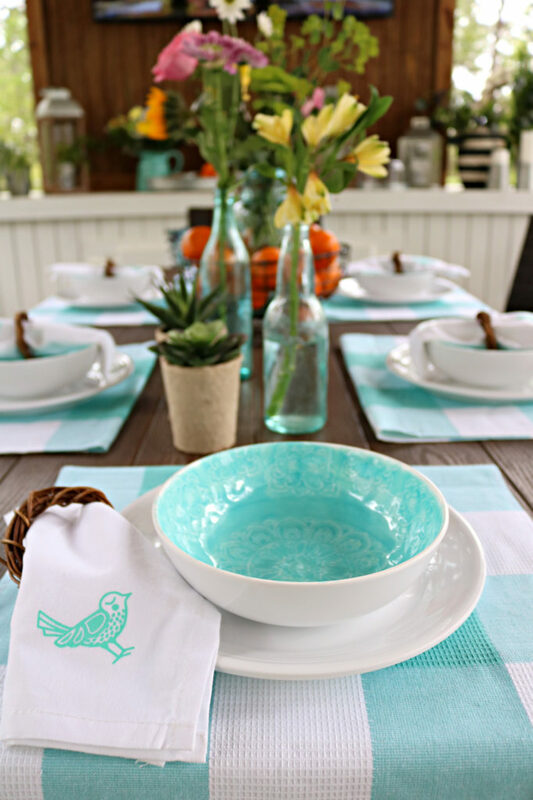 When I spotted these teal buffalo check dish towels, I knew they would make the perfect placemats, the color is beautiful and brings life to my farmhouse style dining table. 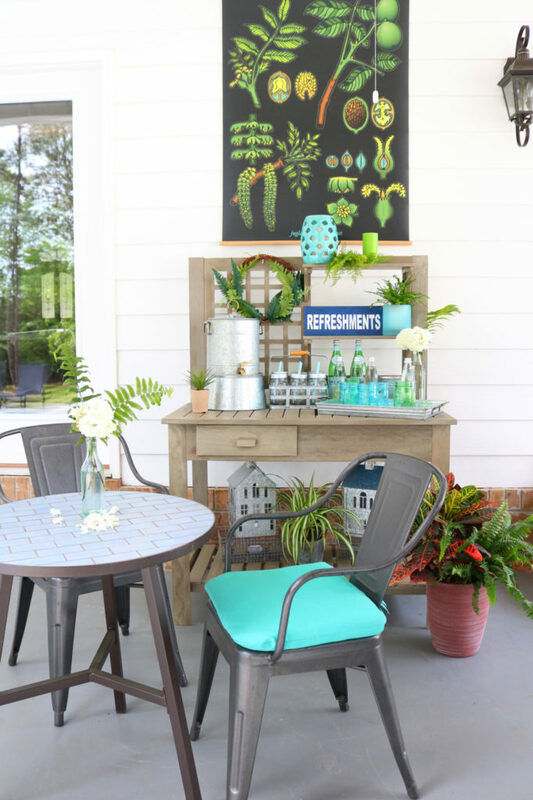 When we designed the kitchen & dining area of our outdoor space on the back porch, we planned out this space for buffet style meals. 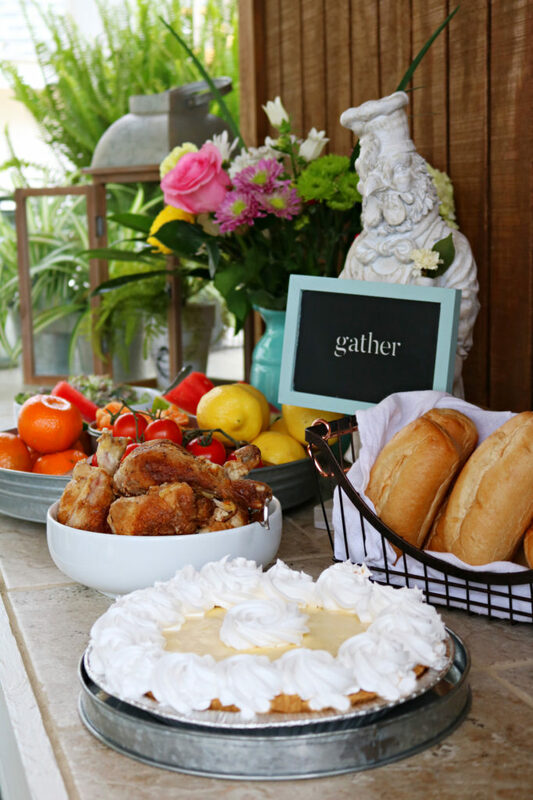 There are several times a year when we host a crowd of family and friends, they always bring a covered dish or dessert and this is where we serve all those yummy dishes. 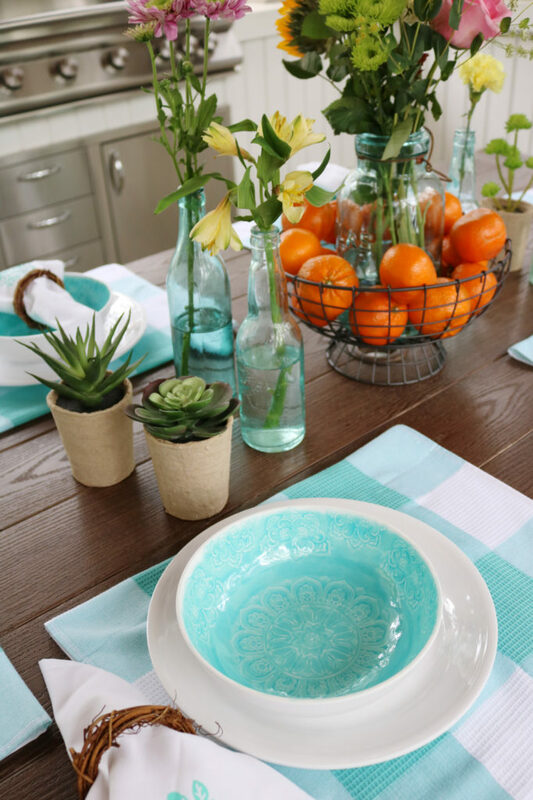 Keep it casual with buffet style dining, make it easy to line up and fill your plate, perfect for porch dining. I don’t know about you but it’s so much more relaxing to have a casual meal. I am all about conversation and relaxing entertaining. Looking back toward the house is where my Better Homes & Gardens potting bench is located. This is where you can grab your drinks. I added more old bottles with flowers from the yard, a dollar store wreath and few blue and green items from the house to spread the color around. 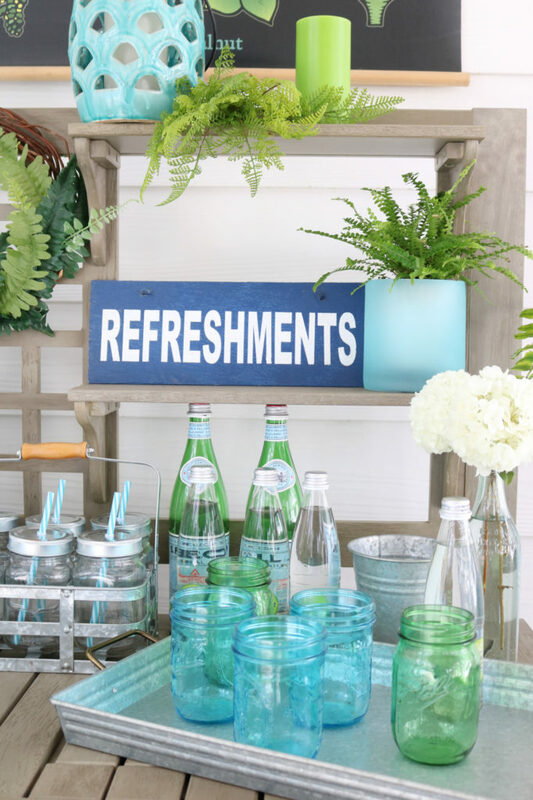 Drink service on this end of the porch. 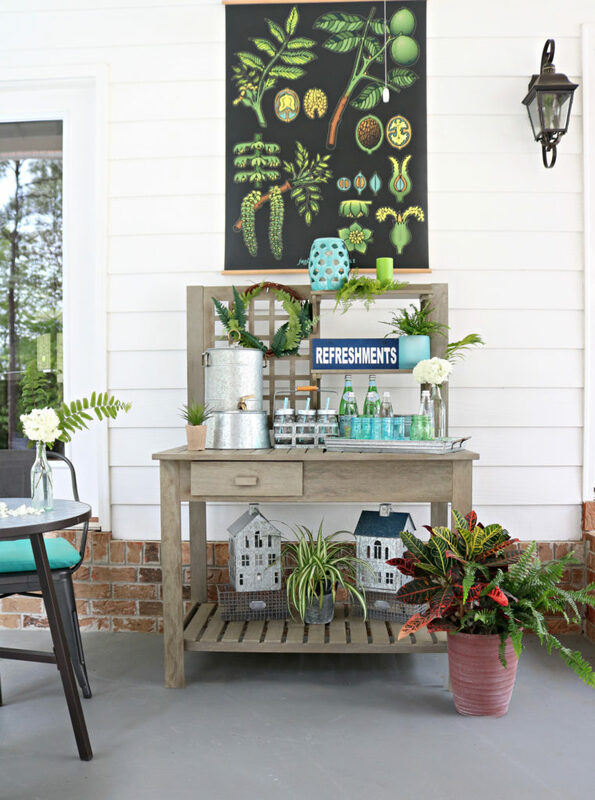 This farmhouse style potting bench is perfect for serving beverages. 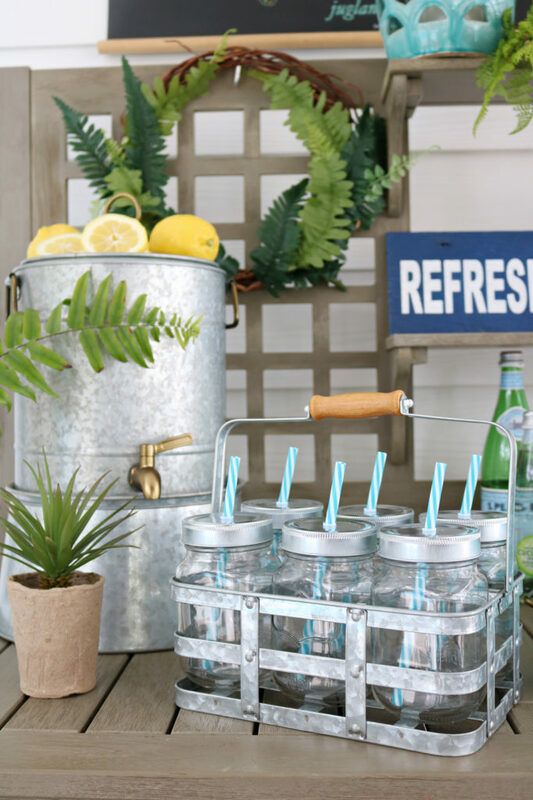 Love the divider on top of the beverage dispenser, it’s great for lemons or other fruit for drinks. 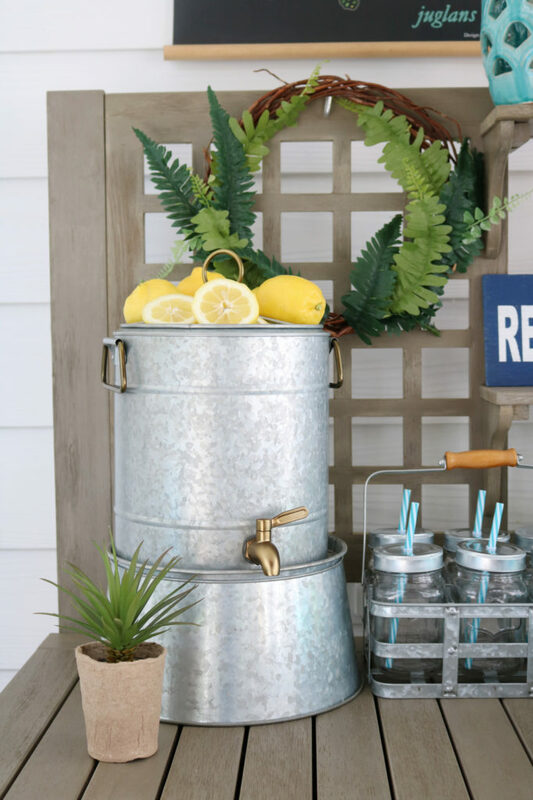 Who doesn’t love sipping lemonade from a mason jar!? 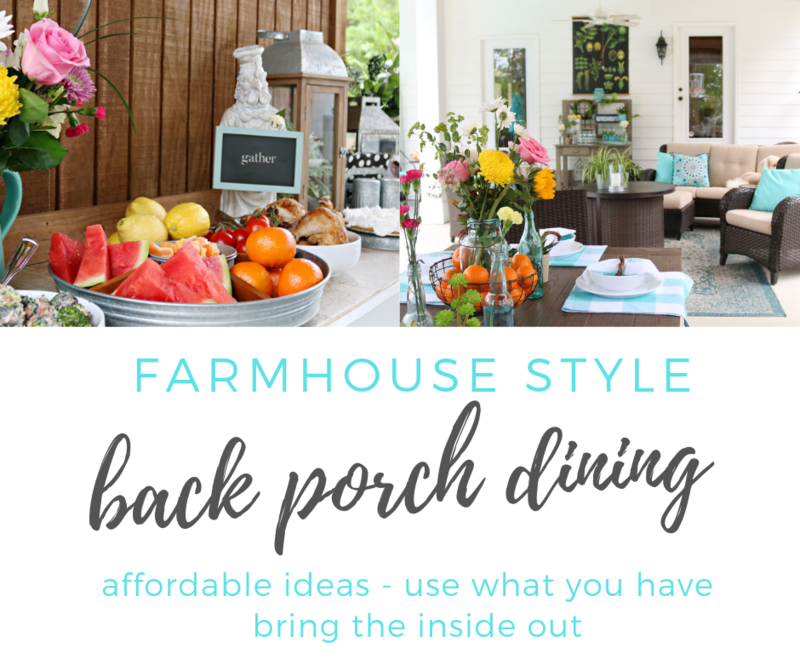 Hope you’re inspired to have a meal outside and enjoy this awesome weather, on your back porch or patio or under a nice shade tree. 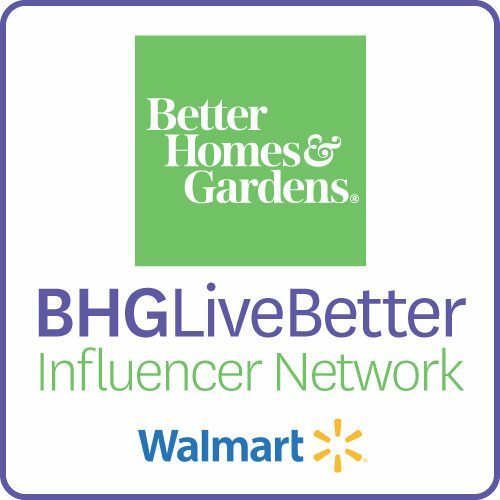 Keep up with all the beautiful Better Homes & Gardens at Walmart choices: Instagram – Twitter – Facebook – Pinterest – Website Be sure to check the store and online! 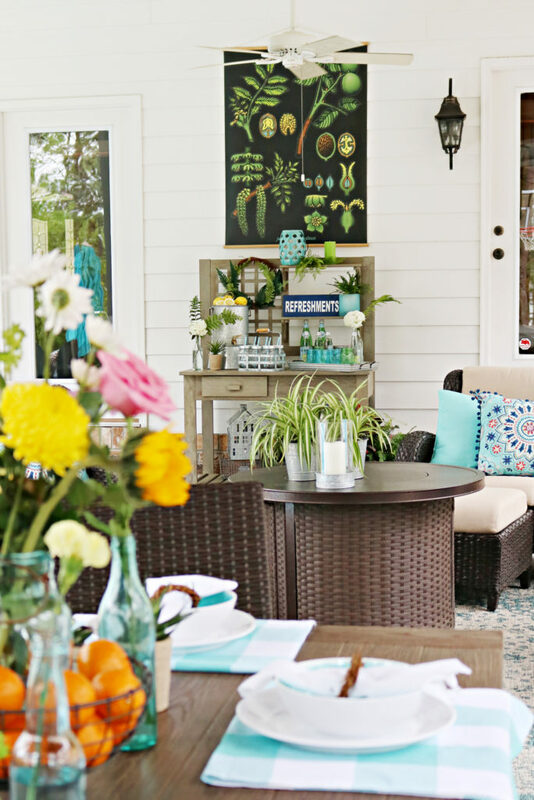 Love this happy outdoor space Debbie! You’ve got it all done up so cute, and your colors look awesome! Great post – thank you! It is so nice to have the links to products included. debbie- i just love all of your outdoor spaces. I imagine once all the pollen is out of here you will be enjoying them immensely. Thanks Laura, all of pollen is gone, thank goodness! It was really bad! Have a great week!